The Electric Light Orchestra lyrics “… you took me ohh, higher and higher baby, it's a living thing, it's a terrible thing …” have been mulling through my head over the past week as central bankers' inflation-fighting rhetoric moved to centre stage. 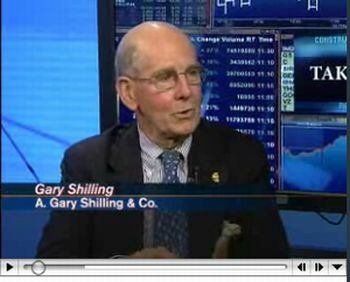 A succession of hawkish comments from US policymakers persuaded pundits that the US rate-cutting cycle was over, resulting in a stronger US dollar, plummeting government bonds, predominantly lower global stock markets (with Asia seeing the most red), and non-agricultural commodities coming off the boil. Ben Bernanke, Chairman of the Federal Reserve, said on Monday that the danger of a “substantial downturn” in the US economy had abated during the past month but that inflation risks were growing. A flood of similar comments from other Fed officials followed, all of which seemed to emphasize concerns about keeping inflation expectations in check, with some making specific reference to the need for a stronger dollar to temper inflation. In addition to Bernanke, the line-up of Fed speakers included Vice Chairman Kohn, New York Fed President Geithner, Dallas Fed President Fisher and Philadelphia Fed President Plosser. The latter two Fed members have been the biggest inflation hawks at the Fed, having dissented at recent FOMC meetings on either the need to cut rates or the quantum of rate cuts. Although a rate hike by the Fed isn't a fait accompli, it was widely accepted that the commentary was a clear indication that the Fed was at least done with cutting rates. Before highlighting some thought-provoking news items and quotes from market commentators, let's briefly review the financial markets' movements on the basis of economic statistics and a performance round-up. 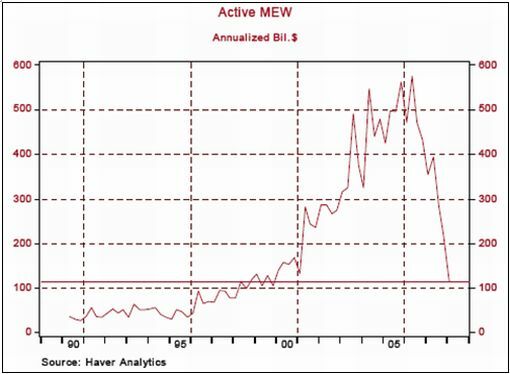 The tone of the most recent US Beige Book was of weaker growth, with the collection of anecdotes noting that “economic activity remained generally weak in late-April and May”. The report was consistent with greater inflation risk from rising prices for energy and other commodities. 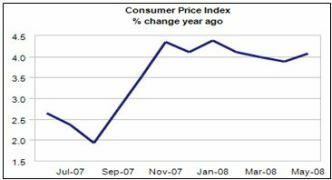 The US Consumer Price Index showed an increase of 0.6% in May and 4.2% compared to May 2007. As expected, the largest single increase was in energy prices and food prices, which increased by 17.4% and 5.1% respectively from a year ago. Still on the inflation front, the US Import Price Index rose by 2.3% in May, led by petroleum prices which rose 7.8% and were up 68.8% over the year. 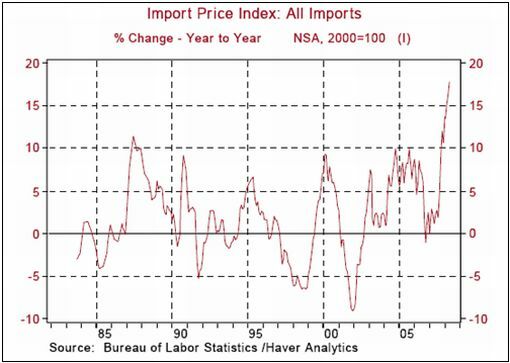 The increase in import prices was larger than expected and bolstered the case for the Fed to end monetary easing. Fed funds futures are now pricing in a 100% chance that the Fed will raise rates by 50 basis points at the October meeting, while there is a 24% chance of a 75 basis point increase. As far as the January meeting is concerned, the futures are pricing in a 98% chance of rates increasing by 100 basis points to 3%. Paul Kasriel, chief economist of Northern Trust , sees the rate situation as follows: “Fed rhetoric will continue to lean on the hawkish side until the June 24 and 25 FOMC meeting. A 2.0% Federal funds rate is the most likely case for the outcome of this meeting. The appreciation of the dollar since Bernanke's comments on June 9 suggests that open mouth policy is working. However, action might be necessary because talk tends to lose power if it is not backed by action eventually. 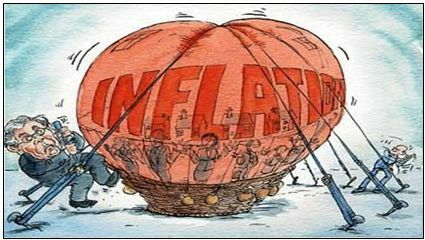 Inflation also remains the major bugbear in other parts of the world. Examples include UK producer price growth staying elevated, with PPI and import prices rising by a record 8.9% and 12.7% respectively from a year ago, and German consumer price inflation accelerating to 3.0% in year-ago terms. Although the European Central Bank moved to damp down market expectations of a flurry of interest rate increases in the coming months after Jean-Claude Trichet's statement of the previous week, bank officials' tone was still decidedly hawkish. The Bank of Japan left the overnight call rate target at 0.5% in the face of Japanese consumer confidence falling to a 6½-year low. Source: Yahoo Finance , June 13, 2008. 1. Producer Price Index (June 17): The Producer Price Index for Finished Goods is expected to have risen 0.8% in May, reflecting higher food and energy prices. The core PPI is most likely to have moved up 0.2% after the 0.4% increase seen in April. Consensus : +1.0%, core PPI +0.2%. 2. Housing Starts (June 17): Permit extensions for new single-family and multi-family homes advanced in April. However, the large stock of unsold new homes suggests builders could be reluctant to break ground as yet, with housing starts projected to have declined to an annual rate of 970 000 from 1.032 million in April. Consensus : 980 000. 3. Industrial Production (June 17): The manufacturing man-hours index declined 0.2% in May, which is indicative of a reduction in industrial production in May after a 0.7% drop in April. Consensus : 0.1%; Capacity Utilization: 79.7 versus 79.7 in April. 5. Other reports : NAHB Survey (June 16), Current Account Q1 (June 17), Philadelphia Fed Survey (June 19). Source: Wall Street Journal Online , June 15, 2008. The MSCI World Index dropped by 2.9% during the past week as concerns about inflation and hawkish central comments gathered momentum, with emerging markets (-5.3%) bearing the brunt of the declines. Asian stock markets, in particular, suffered big losses, for example: the Chinese Shanghai Composite Index (SCI) (-13.8%), the Hong Kong Hang Seng Index (-7.4%), the Taiwanese Weighted Index (-7.3), the South Korean Kospi Index (-4.6%) and the Japanese Nikkei 225 Average (-3.6%). 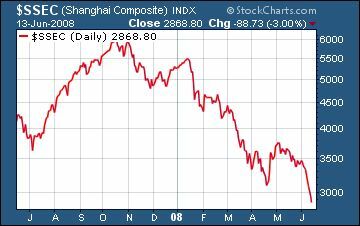 The Shanghai Composite Index has slumped by 52.9% since its high of October 2007 on concerns that measures to keep price increases in check will erode corporate earnings. This rout helped to narrow the price-earnings gap between the Shanghai Composite Index and the S&P 500 Index to 3.1% from 127% at the beginning of 2008, according to data compiled by Bloomberg. Thanks to a solid close-of-week rally, the US stock markets fared relatively well, as shown by the past week's index movements: Dow Jones Industrial Index +0.8% (YTD -7.2%), S&P 500 Index 0% (YTD -7.4%), Nasdaq Composite Index -0.8% (YTD -7.5%) and Russell 2000 Index -0.9% (YTD -4.3%). 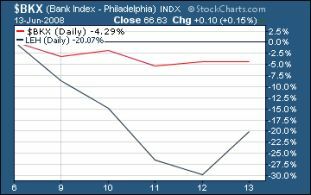 The beleaguered Philadelphia Bank Index edged up on Thursday and Friday to close the week down by 4.3%, with embattled Lehman Brothers (LEH) – plunging by -20.1% for the week notwithstanding a 13.7% gain on Friday – weighing heavily on the performance of the financial sector. The Dow Jones Industrial Index and the S&P 500 Index remain below both their 50- and 200-day moving averages, but the Nasdaq Composite Index and Russell 2000 Index succeeded in creeping back to above their 50-day moving averages (although still below the key 200-day line). 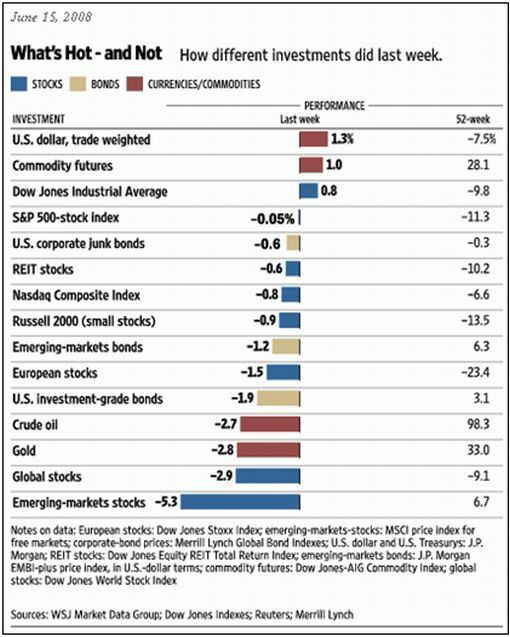 Importantly, all the major US indices managed to survive another week above their March lows. I penned some thoughts on the US stock market, including a few interesting charts, in a post two days ago. 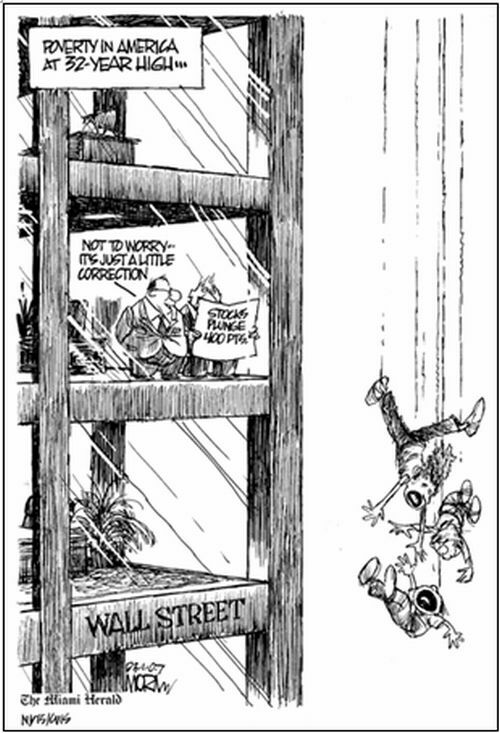 Here is the link: Stock Market: Up, Down, Sideways? Government bonds got dumped as the yield curve adjusted to shifting expectations about the timing of a possible interest rate hike by the Fed. The front end of the Treasury yield curve, being the most sensitive to Fed policy moves, sold off sharply with the yield on the two-year Note spiking by 64 basis points during the week to close at 3.04%. 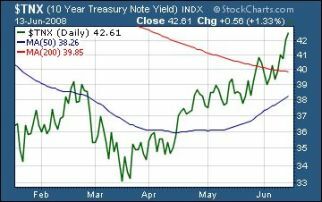 The yield on the ten-year Note, which is more sensitive to inflation pressures, rose by 32 basis points to 4.26%. As far as the rest of the world is concerned, short-dated bond yields were mostly significantly higher. For example, the yield on the UK two-year Gilt jumped by 40 basis points to 5.45%, whereas Japanese two-year yields surged by 11 basis points to 1.0%. US mortgage rates also increased sharply, with the 15-year fixed rate rising by 24 basis points to 6.00% and the 5-year ARM 39 basis points higher at 5.87%. Credit market stress increased as shown by the widening spreads of both the CDX (North American, investment grade) Index and the Markit iTraxx Europe Crossover Index. The pick-up in expectations of US interest rate hikes triggered an impressive 2.4% rally in the US Dollar Index to its highest level in 3½ months and its best weekly performance since January 2005. 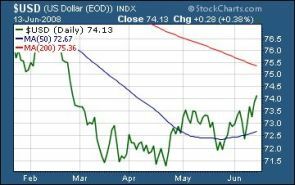 The greenback also benefited from pundits' belief that the US would use the weekend's G8 meeting to mobilize support for the currency. The dollar gained 2.9% against the Japanese yen, 2.6% against the Swiss Franc, 1.1% against the British pound and 2.5% against the euro. The Eurozone currency corrected sharply on Irish voters' rejection of the European Union's new reform treaty – a repeat of three years ago when the Dutch and French condemned the original constitution. The US dollar's gain impacted negatively on commodity prices, particularly crude oil which ended a volatile week 2.2% lower at $135.5 per barrel. Gold bullion and other precious metals suffered the same fate. However, gains in agricultural commodities, following the flooding in the US Midwest, pushed the Reuters/Jeffries CRB (+1.0%) to an all-time high. Both corn (+13.3%) and soyabeans (+7.8%%) set new records, whereas wheat (+10.1%) also moved up strongly on concerns about this year's US crop. Separately, cocoa (+3.7%) climbed to a 28-year high due to a lack of rain in Ghana and the Ivory Coast. 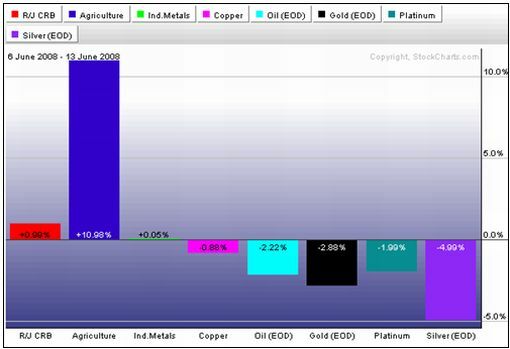 The chart below shows the past week's performance of the various commodities. Now for a few news items and some words and charts from the investment wise that will hopefully assist in steering our investment portfolios on a profitable course. Source: Slate , June 13, 2008. Source: Bloomberg , June 9, 2008. 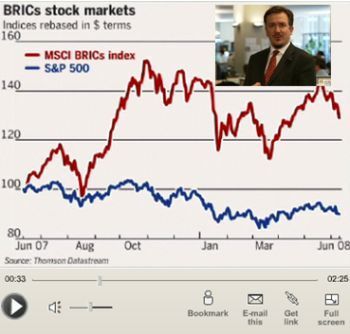 Source: John Authers, Financial Times , June 11, 2008. “Confidence in the global economy ebbed in June as central banks prepared an assault on inflation that's likely to push stocks and bonds lower, a survey of Bloomberg users on five continents showed. “The Bloomberg Professional Global Confidence Index fell to 21 from 22.7, with respondents becoming more pessimistic in every region. A level below 50 indicates negative sentiment. Customers in three of Europe's largest economies also said the dollar may end its two-year swoon against the euro because the Federal Reserve will probably lift borrowing costs. Source: Joshua Gallu, Bloomberg , June 12, 2008. 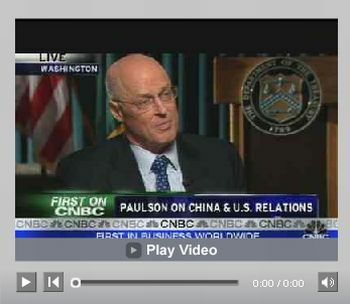 Source: CNBC , June 11, 2008. 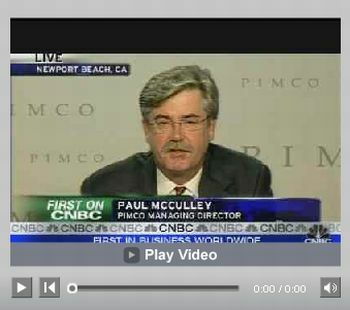 Source: CNBC , June 9, 2008. “The US economy likely peaked in December or January and is now slipping into a recession, the head of the influential National Bureau of Economic Research said on Wednesday. “‘I think we're heading for a recession,' Martin Feldstein said at the Reuters Investment Outlook Summit in New York. He stressed that he was speaking from his personal opinion, not that of the NBER, the unofficial arbiter of US recessions. “‘My sense is that the risk to overall GDP growth over the next six months is still very significant,' he added. “The NBER has not declared a recession and is unlikely to do so for many months. Feldstein, who is also an economics professor at Harvard University, will step down from his NBER post at the end of the month. Source: Emily Kaiser and Ros Krasny, Reuters , June 11, 2008. “The jobs report today has depressed the stock market, for obvious reasons. The popular theory that we would avert a recession and the economy would pick up in the second half now looks very dubious. “Over the last nine recessions, dating back to 1953, that indicator has a perfect record. Every time it has turned negative, the economy is already in recession. And once it turns negative, it stays that way for quite a while. “During that stretch, the figure never went negative without a recession being under way. That is not a complete coincidence, of course, since the employment figures are one factor the National Bureau of Economic Research weighs in setting recession dates. “If we assume that this year falls within the previous parameters, then the recession started sometime between May 2007 and March 2008, with October 2007 the most likely. Based on other data, October is probably the earliest date that the recession could have begun. Source: Floyd Norris, The New York Times , June 6, 2008. “The expected drop in US consumer spending is likely to outweigh the impact of the Treasury's fiscal stimulus package hugely, warns David Rosenberg, economist at Merrill Lynch. “Last week's Federal Reserve flow of funds report showed US household net worth fell $1,700 billion in the first quarter, the biggest decline outside the tech bubble, Mr Rosenberg says. “He says the ratio of household net worth to disposable income has fallen to a level which, if sustained, would be consistent with a rise in the personal savings rate to 2.5%, leading to a drop in consumer spending of about $150 billion. “Food and energy inflation is estimated to be draining discretionary spending by another $300 billion annually and the contraction in the jobs market is crimping personal income by $125 billion. Furthermore, the credit crunch has led to a fall in new household borrowings in the first quarter and this looks to have impinged on household cashflow by a further $200 billion, he says. This adds up to a $775 billion cut in cashflow, equal to a near 12% hit on discretionary consumption. Source: David Rosenberg, Merrill Lynch (via Financial Times ), June 11, 2008. Source: Bloomberg , June 13, 2008. “In this past cycle, it had become very easy for households to turn their increased ‘paper' housing wealth into actual cash by borrowing against their increased home equity. 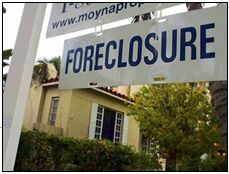 This borrowing is called mortgage equity withdrawal, or active MEW … defined as mortgage equity withdrawal consisting of refinancing and home equity borrowing. Source: Paul Kasriel, Northern Trust – Daily Global Commentary , June 13, 2008. “The ECB is widely expected to raise the policy rate at the July 3 meeting. This is not a terribly supportive action for the dollar. The Fed is in a tough spot and not in a position to raise the Federal funds rate. The alternative is to talk about a strong dollar and raise the importance of inflation, which Bernanke has done in the past week. He was concerned about economic growth and inflation but inflation appears to be of greater significance. “In order to reduce the inconsistency of monetary policy for a strong dollar and a weak economy, the Fed appears to have moved the emphasis to inflation and the dollar. In doing so, Bernanke made these remarks last night. “‘Before turning to those issues, however, I would like to provide a brief update on the outlook for the economy and policy, beginning with the prospects for growth. Despite the unwelcome rise in the unemployment rate that was reported last week, the recent incoming data, taken as a whole, have affected the outlook for economic activity and employment only modestly. Indeed, although activity during the current quarter is likely to be weak, the risk that the economy has entered a substantial downturn appears to have diminished over the past month or so. Source: Asha Bangalore, Northern Trust – Daily Global Commentary , June 10, 2008. “Inflation and inflation expectations have a prominent spot in recent rhetoric of Chairman Bernanke and other officials of the Fed. 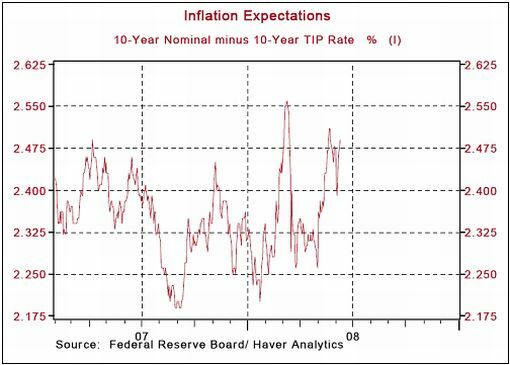 The Fed has constantly stressed the importance of ‘well anchored inflation expectations'. Despite the tough talk about inflation and inflation expectations in recent days, the market estimate of inflation expectations, as measured by the difference between the nominal yield of 10-year U.S. Treasury note and 10-year TIP rate, has moved up from a recent low of 226 bps on May 1 to 249 bps on June 10. “… the Fed is in a tight spot and cannot raise interest rates to contain inflation and support the dollar. But, the Federal funds futures market is projecting a higher Federal funds rate. The November Federal funds futures contract projects a 50 bps increase in the federal funds rate. The January Federal funds futures contract implies a 2.75% federal funds rate. There has been a rapid change in expectations in the last week with the November contract implying a 2.50% federal funds rate today from 2.085% on June 3, when Bernanke presented the latest economic outlook and noted the concern about inflation and the dollar. Source: Asha Bangalore, Northern Trust – Daily Global Commentary , June 11, 2008. “The Consumer Price Index (CPI) advanced 0.6% in May following a 0.2% increase in April. 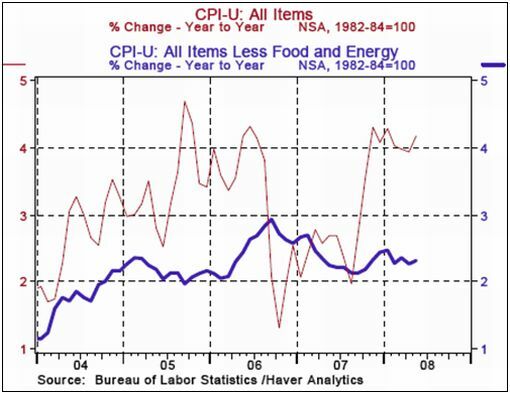 Year-to-date, the CPI has risen at an annual rate of 4.0% compared with a 4.1% increase in all of 2007. The energy price index moved up 4.4% and the food price index rose 0.3% in May. Source: Asha Bangalore, Northern Trust – Daily Global Commentary , June 12, 2008. Did you enjoy this posting? If so, click here to subscribe to updates to Investment Postcards from Cape Town by e-mail. Dr Prieur du Plessis is an investment professional with 25 years' experience in investment research and portfolio management. More than 1200 of his articles on investment-related topics have been published in various regular newspaper, journal and Internet columns (including his blog, Investment Postcards from Cape Town : www.investmentpostcards.com ). He has also published a book, Financial Basics: Investment. 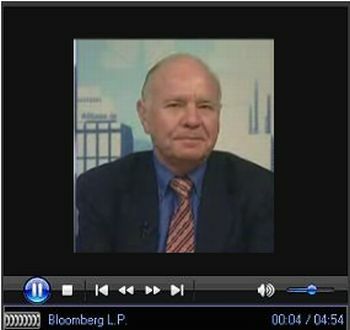 Prieur is chairman and principal shareholder of South African-based Plexus Asset Management , which he founded in 1995. The group conducts investment management, investment consulting, private equity and real estate activities in South Africa and other African countries. Plexus is the South African partner of John Mauldin , Dallas-based author of the popular Thoughts from the Frontline newsletter, and also has an exclusive licensing agreement with California-based Research Affiliates for managing and distributing its enhanced Fundamental Index™ methodology in the Pan-African area. Prieur is 53 years old and live with his wife, television producer and presenter Isabel Verwey, and two children in Cape Town , South Africa . His leisure activities include long-distance running, traveling, reading and motor-cycling. Copyright © 2008 by Prieur du Plessis - All rights reserved. Disclaimer: The above is a matter of opinion and is not intended as investment advice. Information and analysis above are derived from sources and utilizing methods believed reliable, but we cannot accept responsibility for any trading losses you may incur as a result of this analysis. Do your own due diligence.